Location: Apart Hotel Cornelia is located at the foot of Pirin mountain with a unique view to Ian Woosnam Golf Course and the mountains Rila, Pirin and Rodopi. 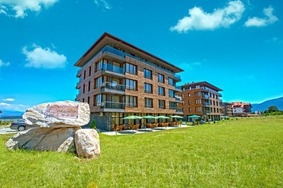 The complex is only at 10 minutes driving distance from the town of Bansko and the ski slopes. Accommodation: Cornelia Hotel offers modern rooms, studios, one and two bedroom apartments. The rooms are stylishly furnished and equipped with TV, Bathroom / WC with shower or bathtub, terrace. The studios and apartments feature kitchenette. Bars and restaurants: The complex offers cozy restaurant and lobby bar. The restaurant serves delicious dishes from the Bulgarian cuisine. SPA centre: Cornelia Spa centre offers mineral water swimming pool, Finnish sauna and steam room with flowers and aroma therapy. Sport and leisure: The region offers ski slopes, Golf course, ATV, horseback riding base. Guests can enjoy walking tours in the mountain, fishing, cycling.